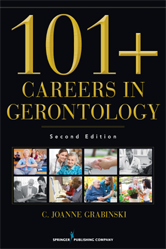 The book describes five emerging gerontology-related fields, updates already existing job profiles including salary scales, and includes many new careers and their education requirements. New interviews are replete with advice and job search tips. What Created the Interest in Gerontology as a Field of Study and as a Profession? What Types of Jobs Are Available in Gerontology? Where Do Gerontological Specialists and Gerontologists Work?